There are two common ways to justify a large body of text: full justification and ragged right. (You could, in theory, center text or use ragged left – with everything aligning on the right margin – but those are best reserved for specialty uses and the avant garde.) Let’s look at the pros and cons of each. Ragged right is how the text in this blog usually appears. The words on the left side of the text create a clean line next to the margin, but the words on the right side do not. The advantage of this is that there is an even spacing between each word, which can make the text a bit easier to read. My fellow academics will probably realize this is how most journals want the text of their manuscripts to be set. Full justification is where the text lines up along both the left and right side. In multi-column layouts, like that often found on a poster, full-justification emphasizes the underlying grid structure, which, in turn, gives the appearance of an ordered and considered text. Most books and magazines usually use full justification. And, just for amusement, I’ve made this paragraph fully justified. If the software did it correctly, you probably wouldn’t have noticed the difference if I hadn’t mentioned it. I find full justification on posters attractive, but it is notoriously tricky to do well. It requires subtle decisions about hyphenation to get the best effect. For example, author Robert J. Sawyer shows how full justification can be a horrible experience in the wrong hands. 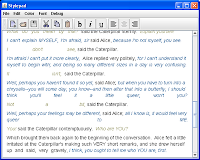 The mid-range word processors and layout tools academics often work with do it passably at best. And it should always be checked by a person. Decisions about the underlying grid can help decide which way to go. Wider columns are much more tolerant of full justification. Narrow columns are often better served by ragged right, unless you’re willing to put in the time and tweak it by hand. Even ragged right can benefit from subtle reworking by hand, although this is probably the reserve of higher end publications. Oh, that sounds interesting. I know what LaTeX is, but I’ve never used it. I would like to know more about using it, particularly for posters. Anyone up for a guest post?